Time mangement in IELTS writing, timing your essays and tips. 1.The fear of failure, this comes from not being prepared. If you feel that you are not quite ready for the exam it will only cause anxiety and you will end up feeling under huge pressure to finish in a set amount of time. My advice: Do not go into the exam without having fixed your weaknesses and got feedback from an IELTS expert on your writing. I advise anyone doing IELTS to spend at least a few months preparing so that when you go into the exam you will feel relaxed. When you feel confident in your writing then you can practice timing your essay in 40 minutes and 20 minutes for a task one. Start easy and then work your way up. 2. Another issue is that many students go into the exam, plan out an essay, start writing and then suddenly get new ideas and think, ‘maybe I should put that in’ hoping to impress the examiner with sophisticated ideas. This will cause you to lose time and it will also ruin your essay. I have had a few students who did this, they couldn’t finish their essay and ended up with a Band 6 even though they were capable of a Band 7. Planning is important in the writing exam. Set aside 10 minutes to plan your essay. It sounds like a long time but you need this time to analyse the question, think of ideas and supporting points and get an idea for the structure. Once you have decided on your plan and got your main points with supporting points, stick to them, don’t suddenly change your ideas when writing, you will only confuse yourself. If you have issues with grammar and vocabulary and you are stuck at Band 5, you will have a lot of work to do that could take months or even a year. It really depends on your study schedule, are you finding the time to study or are you finding excuses not to study?. 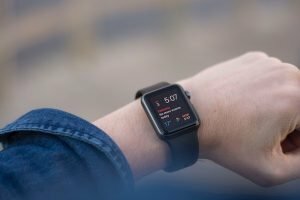 Remember that to jump from a Band 5 to a Band 7 is a huge task. The IELTS test is quite simply testing your English. If you are a Band 5 your English level is around Pre intermediate (B1 on the CEFR scale) so you will need lots of good feedback on your writing and speaking. 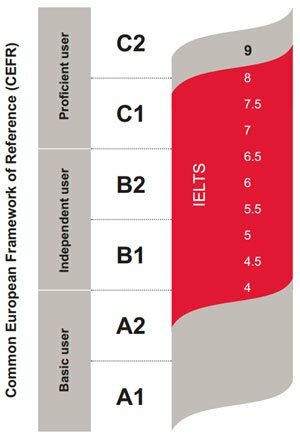 To have a good chance at a Band 7, your English level should be at the higher end of B2 and close to C1 on the CEFR scale below. Are you doing the IELTS exam over and over? Many people studying for IELTS think that by doing practice test after practice test and doing the exam over and over it will give them different results. It doesn’t. Why? because you need to get feedback on what your weaknesses are. For example, if writing is an issue ask yourself lot’s of questions. What part of the writing is the problem? is it paraphrasing?, grammar?, vocabulary?, can’t think of ideas? relevant supporting points? etc… or maybe it’s your task 1 writing that is weak and dragging your score down. Have you made a study schedule? are you finding at least 1 hour per day to work on your weak areas? What feedback are you getting? Can you take criticism on your mistakes?, can you take action to fix your mistakes? Are you just relying on IELTS practice tests? What about real world English like reading news stories, podcasts, reading books?.. it is not just about doing practice tests over and over. How are you developing your vocabulary? Are you just memorising lists? <-(bad idea) Vocabulary work takes a long time and needs focus.. Spend 15 minutes asking yourself questions about your preparation and you will find many areas that need improvement, it’s a big job to jump a band score, your goal is to raise the level of your overall English abilities. Find your weaknesses and start fixing them. It will be worth it in the end.